[0:09] <RaMcHiP> I get the NTP but I am not sure what systemd files are. I can do it with cron right now but if it reboots in the middle of the night, the lights will stay on. [0:11] <RaMcHiP> Holy crap, those look beyond complicated. [0:17] <rem3ndao> is there any znc channel? [0:19] <leftyfb> great. so what's the issue again? [0:21] <RaMcHiP> I have 8 scripts and all they do is turn each relay on and off. [0:22] <leftyfb> RaMcHiP: so there's no intelligence in the scripts to turn things on and off? [0:22] <RaMcHiP> correct, I can find literally 0 examples of it..
[0:23] <RaMcHiP> I mean I can use cron to trigger each script at a certain time but that doesnt account for daylight savings nor can it tell if it rebooted during the night. [0:23] <RaMcHiP> I am sure I can but I dont have the examples or capability of doing it. That is what I am looking for is an example. [0:24] <GeekDrew> or you can set your system time to UTC, which is never adjusted. [0:26] <leftyfb> there's over 250k results on google for "raspberry pi running relay on timer"
[0:28] <RaMcHiP> that doesnt account for daylight savings. I want to keep it in the right timezone (central) and have it turn on and off same time 9am/9pm UTC every day. Plus I would like to be able to add a temp/humidity sensor to control a heatpad but I dont know how to do it and I have searched ALL DAY including your example for an example of someone doing this. I cant find it, I am sorry I am ignorant in this. [0:31] <ali1234> how does the heat pad work? [0:35] <RaMcHiP> That is kinda how I feel about it. I am trying to think of contingencies that could go wrong and I poked about 30 holes in my cronjob idea... Systemd looks like a rats nest. [0:45] <RaMcHiP> How? I dont see any time, I dont see any on/off, I dont see any DHT22 sensor queries, all that will do is launch a bash script at startup it looks like and keep it running.. I dont have a bash script with the logic so its essentially useless to me. [0:47] <leftyfb> what's the obvious reasons again? [0:47] <RaMcHiP> Yeah, I am starting to see that..
[0:47] <RaMcHiP> I have stated them several times. [0:49] <RaMcHiP> well I dont see anyway that I could mod systemd to EVER accomplish the full requirements of the prototype... So once again, its useless for this prototypes parameters..
[0:50] <RaMcHiP> time to learn python. I think that is literally my only route. [0:50] <RaMcHiP> can systemd do dht22 readings as well? [0:51] <RaMcHiP> Why not a python script and use systemd to keep it running? [0:51] <RaMcHiP> well then I need to make me a daemon! [0:54] <ali1234> what type of relays are you using? how are they controlled? [0:56] <RaMcHiP> so just make a python script that does what I want and then use systemd to keep it stable LIKE a daemon right? [0:57] <RaMcHiP> Good god linux is going to be the death of me. Its like the epitome of 10,000,000 ways to skin a cat!!! [1:01] <RaMcHiP> Well I think I just found my solution!!! https://github.com/johnwargo/raspberry-pi-relay-timer/blob/master/solar_times.py thall ignore daylight savings time!! [1:02] <RaMcHiP> Actually even better, thatll give my lizard PERFECT SUNRISE/SUNSET times!! FCK YEAH!! [1:04] <RaMcHiP> but dang thats nice! [1:05] <RaMcHiP> THAT would be noice..
[1:05] <RaMcHiP> OK this is giving me ideas and I found an example I think I can figure this out and merge it! [1:07] <GeekDrew> RaMcHiP: if it were me, i'd check the API periodically, make sure the answer is valid, and then write it to disk if it varies significantly from the current value on disk. that way if the API becomes unavailable or etc., the value on disk would still be reasonably sane, and available. [1:13] <RaMcHiP> does a python script with #!/usr/bin/python execute the same as a bash .sh file through systemd? like I can still do ./lighstemphumidity.py and it'll execute right? [1:14] <RaMcHiP> I think mine is 2. I am assuming 3 is more stable for my purposes which is why your suggesting it? [1:15] <RaMcHiP> I am excited about this though, this is going to be an epic lizard cage after this!! I have a castle grayskull theme going on with black everything. [1:19] <RaMcHiP> so I have to compile 3.5 right? [1:19] <RaMcHiP> no package yet? [1:20] <RaMcHiP> python3.5 set to manually installed. [1:20] <RaMcHiP> how do I check my python version or dictate which version I need to use? [1:22] <erm3nda> anyone of you did compiled 3.6? [1:30] <r3> you could try 'sudo aptitude search pytz' but when I tried it, it didn't find any package by that name. [1:30] <RaMcHiP> I found it. Now I am trying to figure out howto use easy install so I can install it. cli doesnt find it. apt-get doesnt find it. I feel like a dog chasing its tail in linux. [1:31] <r3> easy, there are install instructions on that page. [1:33] <RaMcHiP> then I find this which seems to be absolutely 0 help. [1:36] <r3> don't know why they can't use something like pip to install it if it is just a library? [1:37] <r3> so, RaMcHiP, be sure you even need it? [1:37] <r3> oh. Nevermind me then. [1:41] <r3> automate bash scripts? Why not cron? [1:41] <r3> seems to me you just need to install python3, and pip, and then your library. [1:42] <RaMcHiP> Then I wanted to figure out how to automate them. Bash scripts were a victory. [1:43] <r3> and cron is a very linuxy way to do something at a specified time. Been around forever. Why not use it. I do. [1:43] <RaMcHiP> well I want them to turn on and off at a certain time each day and I want the time zone to be the right time zone and I want it to ignore daylight savings time and basically do sunrise/sunset times. [1:44] <r3> time zones are a world of pain. [1:44] <r3> no, you want to use UTC. [1:45] <r3> it solves needing to use a 3rd party library, and a host of other (future) issues. [1:47] <RaMcHiP> I cant figure out how to install it! [1:47] <r3> take a break because you're not seeing solutions already presented here. [1:47] <r3> ali1234 already told you how to install it. No stress. Don't worry. [1:48] <rem3ndao> which package do you want to install? [1:54] <ahoo> is there a cheaper, less-hyped compact board than the raspi that runs windows 10? [2:00] <RaMcHiP> figured out how to change header to use python3 in the script and can now install missing modules! [2:20] <erm3nda> can you help me a minute? [2:21] <luxio> anyone here running Alpine on their Pi? [2:22] <erm3nda> do you can? [2:27] <erm3nda> Aph3x-WL, did u see any disconnection message from this channel for me? [2:30] <Voop> what is "raspberry pi desktop"? [2:54] <cheekio> you using python 2 or python 3? [2:55] <cheekio> `Deprecated since version 2.7: The optparse module is deprecated and will not be developed further; development will continue with the argparse module. [2:57] <RaMcHiP> well dang this example I found uses relay and relay uses optparse so I am going to have to rewrite this. [3:12] <suttin> Doesn't show up where? Does it show up via lsblk? [3:13] <leftyfb> Voop: how did you write raspbian to the sd card? [3:15] <leftyfb> Voop: got the actual command you wrote? [3:18] <Voop> so sdb1 is a partition? [3:20] <erm3nda> how do you call to destroy your whole system? [3:36] <Zardoz> erm3nda: its not necessary about the children. some people take much offence to it. also it's just not nice to drop f bombs in a public forum. [3:45] <RaMcHiP> AWWWWW YEAH! I think I got this!!!! [3:49] <RaMcHiP> r3, thanks for the suggestions man. I found an older example that did half of what I wanted it to do. Modified it to use GPIO instead of relay and am working on the time on/off slots now but it appears to be working!! [3:50] <RaMcHiP> Its pulling the times and it knows the state of the relay so I think I am set! [3:50] <r3> I use ddrescue to write sd card images. apt-get install gddrescue is the one you want. Simple, one line. [3:50] <r3> RaMcHiP: I didn't do anything. But I'm glad it is working for you! [3:52] <RaMcHiP> I think this is going to turn out REALLY nice though! [3:54] <r3> heh, cheers :) Back to movie night with the Mrs.
[3:59] <learningc> How can I connect the ov7670 camera module to my raspberry pi 3? [4:20] <suttin> Hostnamectl is the command to change that voop. [8:26] <victor2> I have a problem... is anyone aware of FreeNove Starter Kit for RPi? [8:37] <victor2> I have installed XRDP and TIGHTVNCSERVER... can anyone give me a better idea of what each one is and does? Also, how do and why do these two need to be used to RD (Remote Desktop) into the RPi? [8:42] <victor2> any differences? what do you mean by protocols? [8:58] <mlelstv> VNC is also simpler, less features but maybe less problems too. [9:02] <victor2> great thanks! I'm following the Freenove PDF and it doesn't explain any of that... since I'm working between two linux computers I'll focus on VNC then... however, will using VNC help me have remote access to the RPi? [9:02] <victor2> and if so, how can I do that? [9:04] <victor2> I have been doing SSH... but if I have remote GUI could I not just open a terminal in the RPi? [9:13] <ground> Would post this to the forums but capcha. Thanks to the people that found this fix for the 3b+ arm_freq=1200 sdram_freq=450. stable and working great after 3 days of messing about. How common is this rant? [9:25] <CoJaBo> victor2: you could open a terminal from the gui, sure; if it's over LAN, there shouldn't be noticable lag, but over wifi/internet SSH may be more responsive. [9:26] <ground> My test case is a full openwrt/lede build on both RPI with the same official power supply/hub/usb hd/memory card. finishes fine on 3b. Errors on 3b+ until I underclock to the 3b settings. [9:26] <mlelstv> how does it 'error' ? [9:27] <ground> Kernel oops, no more access to USB. [9:27] <CoJaBo> same error every time? [9:29] <ground> So many errors happen it's hard to capture the first all important one. [9:29] <ground> But with the arm_freq=1200 sdram_freq=450 in config.txt no problem no issues. [9:30] <mlelstv> did you log the oops message somewhere? [9:30] <CoJaBo> also check the thermal info, make sure it's not overheating; I don't think it would be, but I don't have a 3b+ of my own yet..
[9:32] <ground> But if I'm one of the few reporting this probably not a huge issue. I'm happy to run at the underclocked settings for the stability. [9:33] <CoJaBo> ground: does the red led flicker at all? [9:33] <ground> I think that's the same problem I've having. [9:34] <ground> No under voltage reports in dmesg. I can't see the leds (blind) so not sure. [9:36] <CoJaBo> It probably is a firmware bug, power/sdcard issues usually tend to be more random. but wouldn't hurt to check to make sure if you have any spare cables/chargers/cards..
[9:38] <ground> I don't think it's that, I am using official ps. and rpi3b runs fine with same sdcard and same usb attachments. [9:39] <ground> I appreciate your help though. Don't expect you to fix it just wonder how many ppl had dropped in the channel with the ame issue. [9:39] <CoJaBo> But it's consistant enough in that thread that I'd bet on a firmware bug..
[9:39] <ground> Yeah I agree with the person in the thread the suggested a race. [9:41] <CoJaBo> If you photograph it, it reboots. [9:41] <ground> In other news I transmitted with a 50 watt rf radio at 145mhz on top of my pi and it crashed. [9:43] <ground> My attempt at sarcasm. Don't mind me. [9:47] <ground> Get one of those crappy cases off ebay. You'll never eject it again assuming you can install the board without breaking the case. [9:48] <CoJaBo> It seems oddly fitting, and it fits oddly perfectly. [10:09] <ground> The worst thing about buying the official power supply in the US... Seeing those plugs and thinking of all the shocks I would have missed out on as a child while trying to plug something with a guide finger on one of the prongs. [10:16] <ground> propaganda be damned. you know you're living in a backwards country when you line all those plugs up. [10:32] <gordonDrogon> the complaint we get in the UK is that when you stand on a plug ... it hurts!!! [10:33] <gordonDrogon> only marginally more painful than standing on Lego though. [11:00] <poolson> WHATS UP DUDES ! [11:05] <poolson> oh dudes i finally finished my little wifi stealing ICMP tunnel device ! [12:18] <red9> Anyone played with AHB2/APB2 clock speed setup? [12:23] <Angs> I've installed a fresh raspbian image. It doesn't have /etc/rc.local file. Is it replaced with another folder? [12:26] <Angs> do you know what else can I use to run a command at a start up? [13:19] <poolson> no rc.local ? [13:19] <gordonDrogon> you can create it, as I'm sure you know, but systemd is deprecating al the rc* stuff, as I'm sure you know. [14:20] <ShapeShifter499> So I just got my raspberry pi 3 b+ in the mail yesterday. Should I be running a 64bit OS or 32Bit? [14:24] <ShapeShifter499> Habbie: I was looking into running arch linux arm actually. They seem to push 32Bit over 64Bit even though a 64Bit OS is available. [14:25] <gordonDrogon> stick to Raspbian. [14:26] <ShapeShifter499> gordonDrogon: is there anything I'd be missing by not running Raspbian? [14:26] <gordonDrogon> I don't know - I run raspbian, so don't know what I might be missing. [14:30] <Habbie> my123, how much do the pi1 'optimisations' hurt on pi3? [14:31] <Habbie> why is that? [14:51] <ShapeShifter499> my123: Honestly I'll checkout Arch Linux Arm first. [15:25] <uniqdom> Hello, how can I install python-scipy in the latest Raspbian? [15:25] <uniqdom> sudo apt-get install python3-scipy returns "Package 'python3-scipy' has no installation candidate"
[15:26] <Habbie> what does apt-cache search scipy show? [15:27] <uniqdom> Habbie: well... an "apt-get update" did the trick. [15:38] <Habbie> Hero1980, did you mean to join #mqtt ? [15:39] <ShapeShifter499> My goal was to run Nextcloud on my Pi 3 B+. Should I have a swap partition or file? [15:42] <gordonDrogon> ShapeShifter499, always best if you can run without swap, but there is no difference from a partition or file these days. a small file is sometimes helpful - a few 100MB. [15:54] <Hero1980> but this PubSubClient.h library is only fro Arduino am i right ? [15:59] <red9> Swap is for magnetic medium. For flashmedia it's devestation. [16:00] <red9> The Raspberry Pi is fine as a I/O platform. To use it as a heavy server that needs swap. Something else has to be done. Like USB-attached spinning rust or RAM-on-USB etc. [16:01] <JimBuntu> red9, Well, it seems few understand oxidation. [16:02] <red9> I had some ideas of lately if it's possible to make floppies, cassette tapes and low capacity HDD using sputtering of FeO2 or deposition. [16:04] <JimBuntu> I want to say that I doubt home-brewed ferric oxide deposition would yield reliable results, but I have also seen some pretty cool home labs. [16:13] <red9> JimBuntu, Any idea how say floppy iron oxide is attached to the plastic disc? [16:15] <red9> asfair the predecessor to IBM 305 RAMAC was done by mixing paint + iron oxide. [16:17] <r3> then this is not enough? "sudo systemctl disable dphys-swapfile"
[16:17] <red9> man swapoff ? [16:18] <red9> JimBuntu, So Mylar it is? [16:18] <red9> JimBuntu, But what makes it "stick" ? or is mylar + iron oxide sputtering enough? [16:19] <red9> Of course if the particles are hot enough they ought to embedd themselves. [16:19] <red9> Do you see which iron oxide type is used? [16:20] <JimBuntu> Not as of yet, simply says iron oxide. [16:21] <red9> btw, wikipedia mentions 60 MByte per compact cassette if QPSK + helic scan etc is used. [16:21] <JimBuntu> Ah, Barrium ferrite is what's used on LTOs. [16:22] <red9> As to why floppies are interesting is because some machines needs such media to boot etc. And it's kind of hard to buye..
[16:23] <mlelstv> it's much easier to simulate the signals to the floppy controller. [16:24] <red9> It can't even deal with LocalTalk @ 230.4 kbit/s..
[16:24] <red9> Because it got UART, not USART..
[16:25] <gordonDrogon> there are a few little emulators for most old 8-bit micros to emulate their floppy drive - often having on-board CF type drives. [16:26] <mlelstv> emulating a floppy isn't that difficult. 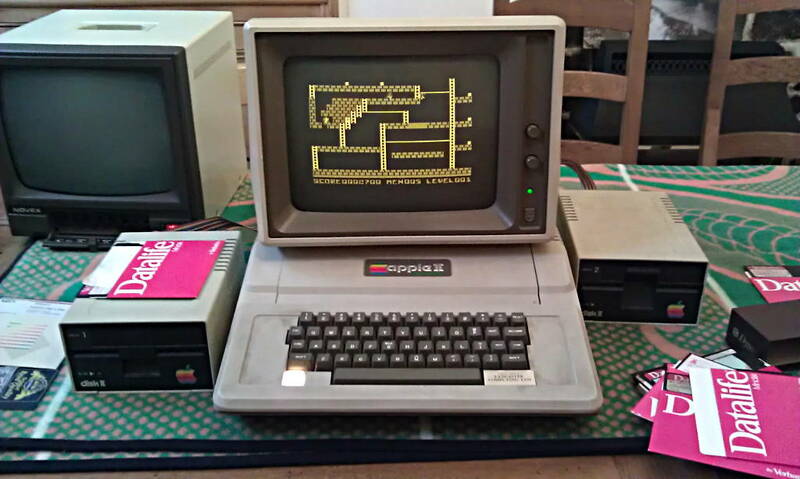 [16:26] <gordonDrogon> I'm keeping my 5.25" Apple II floppys in as good as condition as I can, although I know they won't last forever... there are, however, alternatives. [16:29] <binaryhermit> how much power does an Apple II use? [16:30] <red9> Re floppies. I have some thoughts on attaching a hi-speed MCU A/D the analog way to the read head in order to be able to rescue really hard to read floppies. [16:41] <uniqdom> Hey, I have a .img backup of a microSD card that had Raspbian. I have a new microSD card that seems to have less space (about 157 MB less). Now, I want to burn that .img in the new microSD, but my system (Debian Stretch) says that "The disk image is 157MB bigger than the target device". Is it safe to discard/remove/trim the latest 157MB? [16:42] <uniqdom> I know that that image has near to 6GB of the 16GB used. [16:43] <gordonDrogon> the apple II was about 35W IIRC. [16:44] <gordonDrogon> there's a lot of old LS TTL in the Apple II. [16:45] <binaryhermit> is that 35W without monitor or with? [16:52] <futurecat> Has somebody here ever managed to compile Webkit/WPE for Raspbian? [17:09] <uniqdom> Bejjan: did you "apt-get update"? [17:14] <Habbie> are you holding it flat? or up straight? [17:15] <r3> is there a CRT nearby? Or other magnetic sources? [17:16] <Bejjan> no, i compared with phones compass aswell, doesnt seem to be any notable "interference"
[17:26] <stiv> ali1234, you've got me curious. what does the output look like? [17:32] <BurtyB> Tenkawa, is the connector still attached to the board? [19:05] <Tenkawa> anyone running a 64 bit kernel on their rpi3+ yet? if so what do you think? [23:48] <mfa298> Voop: continuity where ?